The year is 1180BC. Ninety seven years ago our sea-faring tribes united together into a terrifying force our enemies would fearfully call 'The Sea People'. On the back of our success raiding coastal towns, the king of the Sea People led a daring assault on the Nile delta itself, but our courage and bravery was thwarted by the cunning pharaoh Ramessess II. Presenting a small naval front to us, he hid the bulk of his ships in the wings. Then as the engagement commenced we were attacked from all directions, and amongst the chaos he set his archers on us - hidden in the banks with flaming arrows. For almost a hundred years our tribes have feared the Nile delta - the stories ingrained in generations of our children, including yourself. Burning ships illuminating the night as screams echo off the Nile water. Blood-bleached wood fading to brown as it's wrapped in flames, before being swallowed into the inky depths. Yet, a new dawn is coming. Your uncle, tribe elder of the powerful Shekelesh people, has grand plans to once more unite the sea people against the Nile delta. But alas, the current Pharaoh Ramessess III has advisers well-versed in history - for self-congratulatory records of Ramessess II's victory are kept on tablets and papyrus in vast Egyptian libraries. Thus Pharaoh will be prepared for the same assault that his predecessors faced, and so you, daughter of the sea people, instead have led several discreet ships down the Nile in an unusual mission for your people. For rather than be filled with soldiers and weapons, they were packed with settlers and supplies. You were lucky, undetected, and arrived on a small archipelago halfway down the Nile. Here you must settle a town. Meanwhile, recently alerted of our presence, Pharaoh Ramessess III views our small colony as a nuisance and has attempted to starve us out. He has ordered all Egyptian farming cities to not trade food with us. But though they are fearful of his wrath they are eager for business. Perhaps you can outsmart him and his cruel decree? You will also find several foreign cities far north and south, but they risk souring Egyptian relationships by trading with you. Also of note is the bustling harbour city Pwenet, which is currently feuding with local Egyptians over ownership of trade routes. If you are able to provide them with an unlikely ally they are sure to widen the doors of trade to your city. You also mustn't delay building a military, as roaming Bedouins have been scouted northwest of our city, and are keen to pillage anything they can find. As you grow you will also find yourself the frequent target of neighbouring Egyptians, who seek to win the favour of Pharaoh. Combined, these will form a bombardment of attacks that will keep you busy. But don't forget who it is that you ultimately seek vengeance from. For now, Pharaoh watches you from his capital as merely one of many nuisances, hoping that you quietly disappear under the weight of the many obstacles you face. Survive and flourish into a serious threat and he will turn his full attention to you. Beware, for his armies are fierce and the Egyptian god Seth protects him in battle. But if you are able to fend off his invasions then a key opportunity will arise. Join your uncle in battle as they attempt a direct assault on Pharaoh's capital city, Pi-Ramesses. As a final insult to Pharaoh, use captured Egyptian architects to finish building Pharaoh's burial pyramid in our city. Then, have his corpse sent from defeated Pi-Ramesses and ensure he gets a 'proper burial'. Let the inevitability of the Sea people's vengeance be known throughout the whole world. Note 1. This has been repeatably play-tested on very hard difficulty so the balance may be off for other difficulties, especially below hard. Very hard is challenging and will take a few failed attempts before getting a feel for what's required of you. If you find it too difficult I recommend reading some of the tips in the comments below and then if still struggling reduce the difficulty to hard. The scenario takes ~50 years to resolve the main story-line and win. Note 2. Some of the event text may not align correctly with the Sea People story (I experimented with custom text but it requires modding) so focus on the consequences of events rather than their text when in conflict. Note 3. The price of goods has been significantly and carefully redesigned for balance (my background is statistics). It will be a new experience and the viability of economic strategies will be different from what you are used to. Money is more valuable as there are extremely expensive late-game combat necessities (chariots, towers, and warships), so you won't be just watching your debens rise boundlessly once you've 'solved' the level. Note 4. Treat the deben gift in the first month like starting money - it's just to balance difficulty between very hard and hard. Fort placement (I like to keep a few on the first island) and managing morale between fights is also important. If you send seaborne troops be sure to unload them asap when they return or they seem to freak out and disappear. It's OK to save before big fights to get a sense for how/where they'll attack and what strategy to use against it. In general the larger the army the longer the time between when you're alerted and when they arrive, so if you see Bedouins coming in 18 months don't expect the usual sorry squad (if you want it really 'spoiled' see the timeline in the notepad file). Archers serve an important role in the early game as fodder for towers, infantry are an affordable replacement in the mid-game, and chariots are extremely powerful but prohibitively expensive until late-game. By the final assaults you'll need full chariots - and I recommend using the reoccurring small invasions to train your chariots beforehand. You have a lot of starting gold but need to quickly build a base and get a military and economy going. Almost all events are cyclic so don't have to do everything at once. I like to start the pyramid slowly at ~25-40 years so it can be ready for Pharaoh at 50 years. Building placement is very finicky and you'll need a few attempts before you can get the most out of the islands' limited space. You'll want to give some thought to where you place defences, housing districts, industry, and especially food production. I like to do a few nice housing districts that receive food and then later some poor ones to bolster population, but if you're better with building placement maybe you can get more out of your food production than me. Economic management is a big challenge, as all the fighting is expensive. Each of the 5 initial 'primary' trade routes produce ~1000 debens per year through trade, and then additional trade routes produce ~3000-8000. Pwenet starts at ~2000 but scales to 10000+ depending on your choices of events. Unlike in regular Pharaoh, population is more of a resource here, as housing quality is heavily restricted, space is scarce, and it's expensive without taxes. This means you want to focus on a few resources to trade and heavily optimise yourself around this. For instance, do you go a population-heavy mining strategy, colonise the rocks, and open stone trade routes? Or maybe you spread to the farmland in order to grow henna and seek events to increase paint demand? Or do you open water trade routes to profit off complex industries like lamps, weapons, jewellery, papyrus? (in this case I suggest a lot of towers+warships near your docks). There are also 'high capital' industries (e.g. chariots and marble) that make good net deben but can easily send you below -5000 in the meantime - I like these later on when you have a healthy bank account. I'm sure there are many more great strategies that you'll think up - try to play on very hard or hard if you're a Pharaoh veteran - have fun and good luck. This clearly took quite some time. All prices are different, the trade routes are tailored exactly to the story line! This map pretty much hits all taste buds...! The map is not designed to be easy...! But it's very playable. Thanks so much for the review burt! Yeah you're right - the combat difficulty is extreme to the point of being frustrating - I lose more often than I win haha. 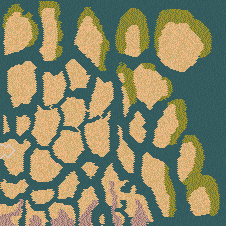 I might tweak the map to make it a bit easier. Which part of combat did you find the most challenging - the early attacks before you were prepared, the bombardment of attacks in the mid-game, or the last few epic fights with pharoah? Yeah it's a bit devilish with the game meat - I keep eating it accidently haha (and so scripted a back-up event in case you make this mistake too). and yeah haha I've experienced the 'magic bricks' bug you mentioned - I'm not sure exactly what causes it, but it seems to be related to what the storage yard is accepting (some combination of beer, clay, pottery, and straw I think), and then traders can drop bricks in it even though they don't sell it and you're not importing it. They make you pay for it too! Funnily enough I've observed another bug too: occasionally you can manage to defeat the attack caused by your kingdom rating hitting zero, and then sometimes all the cyclic events in the game can get 'reset' and duplicated. This means all of the story gets duplicated, but even worse all attacks will be 2x or 3x as frequent - utter nightmarish chaos! Thanks again so much for your review burt!